Enter to Win Alan Jackson Concert Tickets! Celebrate summer outdoors enjoying the sights & sounds at New Hampshire’s favorite outdoor venue, courtesy of Kittery Trading Post! 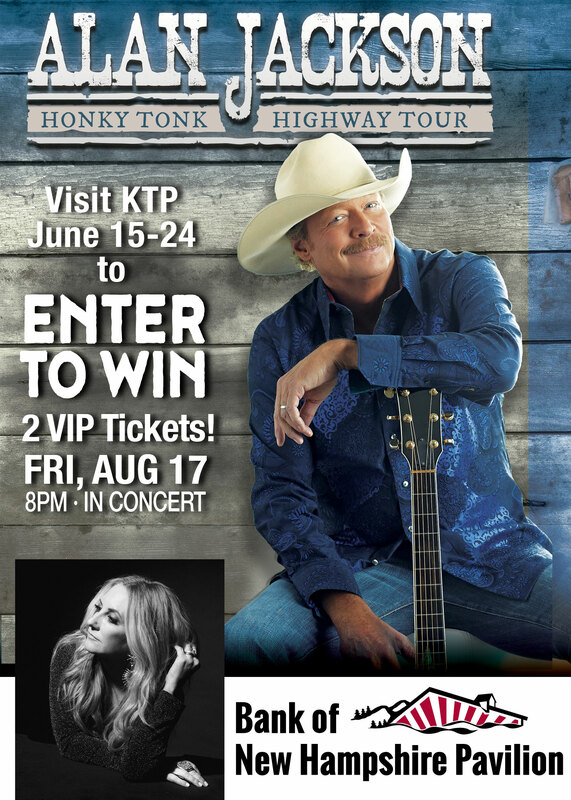 Here’s your chance to score two VIP tickets to see & hear best-selling singer/songwriter ALAN JACKSON & LEE ANN WOMACK at Bank of New Hampshire Pavilion on Friday, August 17 at 8pm. ENTER TO WIN at Kittery Trading Post, Route 1, Kittery, ME between June 15 & 24. Store hours are Monday thru Saturday, 9-9, Sunday 10-6. VIP tickets include access to private VIP Entrance, VIP Lounge & Restrooms. MB Tractor Premium Parking Pass (West Entrance) & KTP Wooded Tent Site are also included. Over $230 Value. No purchase necessary. You must be 18 years or older to enter. Only one entry per person will be accepted. The winning entry will be drawn Monday, June 25.